A stellar marketing strategy is one of the key ingredients to success. But knowing you need a great strategy and actually building that strategy are two entirely different animals. At Denamico, we’re no strangers to building inbound marketing strategies. In fact, every one of our inbound marketing retainers begins with its own strategy project. We also develop marketing strategies as a stand-alone service. 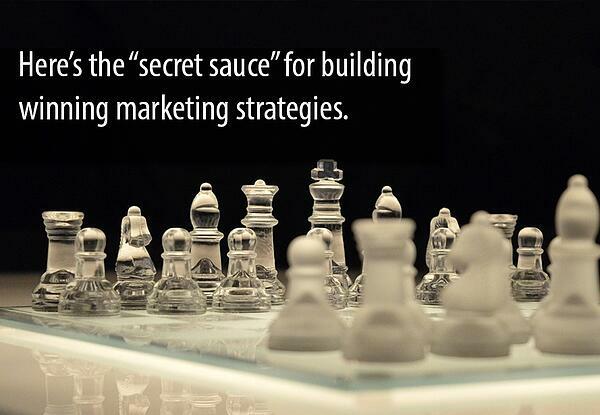 And now, we’re going to share the “secret sauce” behind our agency process for building winning marketing strategies. Our marketing strategies begin by clearly defining the priority business objectives. For instance, big-picture business objectives could include any of the following: increase gross sales by X dollars; achieve Y% change in number of sales vs last year; launch a new product. We’ve found that it’s beneficial to focus on the top two or three most important business objectives. If you can’t narrow business objectives down to the top three, then the marketing strategy is at risk of becoming too large and unwieldy. We also examine and prioritize the strongest potential sources for business growth. For example, we could focus on growing the customer base by reaching a new, untapped audience. Or, the business could focus on acquiring customers from the competition. And still yet, business growth could come from greater customer retention and upselling. Attract (site visitors). SMART Goal Example: Achieve 4,900 monthly website visits by [date]. Convert (visitors to leads). SMART Goal Example: Generate 150 leads per month by [date]. Close (leads to sales). SMART Goal Example: Close 15 new sales per month from inbound leads by [date]. Tip: Organize your business objectives, marketing goals and objectives using a chart or spreadsheet. What is your brand history/origin? What benefit do you offer? What does your brand stand for and aspire to? The biggest barriers to reaching priority business goals. Biggest strengths helping the business reach its destination. Once we’ve covered the major business-centric groundwork of developing business/marketing goals and defining brand promise, we are ready to move on to a more buyer-centric focus. During this step, we develop deep audience insights. One of the most effective tools for defining target audiences is a buyer persona. A buyer persona is an in-depth representation of a business’s ideal customer. A buyer persona digs deep to illuminate how a business’s product or service is fulfilling the persona’s need or solves their problem. It also provides the foundation for addressing why that persona should choose your business. Discovery meetings with business leaders, marketers and sales staff. Insights gleaned from a business’s existing data on buyers. Market research and open data, including social data. After we’ve conducted the persona research, we package our findings and insights into comprehensive, multi-page persona profiles. The final asset is much like the buyer persona template we have here. In the meantime, if you have questions about your own marketing strategy, feel free to reach out to us! We love to talk marketing strategy. But more importantly, we’re great listeners.